Consumer electronics or home electronics are electronic (analog or digital) equipments intended for everyday use, typically in private homes. Consumer electronics include devices used for entertainment (flatscreen TVs, DVD players, video games, remote control cars, etc. ), communications (telephones, cell phones, e-mail-capable laptops, etc. ), and home-office activities (e.g., desktop computers, printers, paper shredders, etc.). In British English, they are often called brown goods by producers and sellers, to distinguish them from "white goods" which are meant for housekeeping tasks, such as washing machines and refrigerators, although nowadays, these would be considered brown goods, some of these being connected to the Internet. [n 1] In the 2010s, this distinction is not always present in large big box consumer electronics stores, such as Best Buy, which sell both entertainment, communication, and home office devices and kitchen appliances such as refrigerators. Radio broadcasting in the early 20th century brought the first major consumer product, the broadcast receiver. Later products included telephones, televisions and calculators, then audio and video recorders and players, game consoles, personal computers and MP3 players. 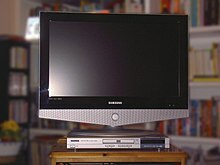 In the 2010s, consumer electronics stores often sell GPS, automotive electronics (car stereos), video game consoles, electronic musical instruments (e.g., synthesizer keyboards), karaoke machines, digital cameras, and video players (VCRs in the 1980s and 1990s, followed by DVD players and Blu-ray disc players). Stores also sell smart appliances, digital cameras, camcorders, cell phones, and smartphones. Some of the newer products sold include virtual reality head-mounted display goggles, smart home devices that connect home devices to the Internet and wearable technology such as Fitbit digital exercise watches and the Apple Watch smart watch. See also: Category:Consumer electronics retailers. ^ "Brown" from the bakelite and wood-veneer finishes typical on 1950s and 1960s radio and TV receivers, and in contrast to "white goods". ^ "brown goods". Collins English Dictionary. Archived from the original on 8 December 2014. Retrieved 5 December 2014. ^ McDermott, Catherine (30 October 2007). Design: The Key Concepts. Routledge. p. 234. ISBN 9781134361809. Archived from the original on 18 April 2016. Retrieved 5 December 2014. ^ Schaller, Bob (26 September 1996). "The Origin, Nature, and Implications of Moore's Law. The Benchmark of Progress in Semiconductor Electronics". Microsoft Research. Archived from the original on 28 August 2014. Retrieved 10 September 2014. Moore viewed the 1959 innovation of the planar transistor as the origin of "Moore's Law. ^ "Consumer Electronics Manufacturing Industry Overview". Hoover's. Archived from the original on 20 July 2014. Retrieved 9 September 2014. ^ Mike Deng (23 October 2012). "China Moves to Automate Electronics Manufacturing". Quality Digest. Archived from the original on 12 April 2013. Retrieved 11 June 2013. ^ Baker, Phil (11 August 2014). "Why can't the US build consumer electronic products?". San Diego Source. Retrieved 9 September 2014. ^ Gamble, Craig (22 August 2014). "Shenzhen in China becomes a power source for the electronics industry". Brisbane Times. Archived from the original on 25 August 2014. Retrieved 9 September 2014. ^ Hachman, Mark (4 September 2014). "Microsoft announces two Lumia phones, always-on Cortana, and clever new mobile accessories". PC World. Archived from the original on 10 September 2014. Retrieved 11 September 2014. ^ "Electronics hardware consumption poised to touch *360 bln by 2015". One India. 13 April 2008. Archived from the original on 12 September 2014. Retrieved 11 September 2014. ^ "Signal Converter of Consumer Electronics Connection Protocols (US 20120287942 A1)". IFI CLAIMS Patent Services. 15 November 2012. Archived from the original on 15 September 2014. Retrieved 12 September 2014. ^ Hornyak, Tim (2 September 2014). "Jack Wayman, founder of CES trade show, dies at 92". PC World. Archived from the original on 10 September 2014. Retrieved 9 September 2014. ^ Simon Sherratt, Editor-in-Chief (EiC), IEEE Transactions on Consumer Electronics, http://cesoc.ieee.org/publications/ieee-transactions-on-consumer-electronics.html Archived 29 July 2016 at the Wayback Machine. ^ Saraju P. Mohanty, Editor-in-Chief (EiC), IEEE Consumer Electronics Magazine, http://cesoc.ieee.org/publications/ce-magazine.html Archived 12 July 2016 at the Wayback Machine. ^ a b Murphy, H. Lee (27 January 2014). "Why consumer electronics retailers are the next record store". Crain's Chicago Business. Retrieved 11 September 2014. ^ eMarketer (11 April 2014). "US Retail Ecommerce Sales Highest for Computers, Consumer Electronics". The Huffington Post. Archived from the original on 12 September 2014. Retrieved 11 September 2014. ^ Sherman, Erik (19 December 2011). "Hold off extended warranties until you read this". CBS News (Moneywatch). Archived from the original on 12 September 2014. Retrieved 11 September 2014. ^ Cellan-Jones, Rory (8 December 2012). "Look round Shenzhen's Electronics District". BBC News. Archived from the original on 22 July 2016. Retrieved 20 July 2016. ^ Todd, Deborah M. (18 August 2013). "Electronic repair industry gets second wind". Pittsburgh Post-Gazette. Archived from the original on 7 April 2015. Retrieved 11 September 2014. ^ a b Chu, John (1 November 2012). "3 Easy Tips to Reduce Your Standby Power Loads". Energy.gov. United States Department of Energy. Archived from the original on 10 September 2014. Retrieved 10 September 2014. ^ Lippert, John (17 August 2009). "Please Stand By: Reduce Your Standby Power Use". Energy.gov. United States Department of Energy. Archived from the original on 11 September 2014. Retrieved 10 September 2014. ^ Harvey, Fiona (26 June 2012). "Leaving appliances on standby 'can cost UK households up to £86 a year'". The Guardian. Archived from the original on 10 September 2014. Retrieved 9 September 2014. ^ Carr, Matthew (2 July 2014). "Electronic Devices Waste $80 Billion of Power a Year, IEA Says". Bloomberg L.P. Archived from the original on 10 September 2014. Retrieved 9 September 2014. ^ Moreno, Julia (8 September 2014). "Normal is recycling out-of-date electronics". Vidette Online. Illinois State University. Archived from the original on 10 September 2014. Retrieved 9 September 2014. ^ Bhowmick, Nilanjana (23 May 2011). "Is India's E-Waste Problem Spiraling Out of Control?". Time. Archived from the original on 8 October 2014. Retrieved 14 September 2014. ^ a b "Health Risks of Electronic Devices". The Women's International Perspective. 12 July 2015. Archived from the original on 3 June 2017. Retrieved 26 May 2017.